Moments ago, the United States withdrew from the United Nations' Human Rights Council after no other countries “had the courage to join our fight” to reform the “hypocritical and self-serving” body, said U.S. Ambassador to the United Nations Nikki Haley. 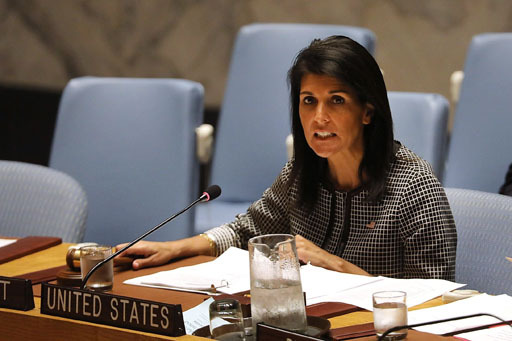 “In doing so, I want to make it crystal clear that this step is not a retreat from our human rights commitments,” Haley added. U.S. Ambassador to the U.N. Nikki Haley announced the withdrawal alongside Secretary of State Mike Pompeo, following multiple news reports that the move was imminent. Haley blasted the council as a "protector of human rights abusers and cesspool of political bias" and accused the body of "politicizing and scapegoating countries with positive human rights records." The withdrawal, which comes as the 47-member body begins a three-week session in Geneva, had been expected as a result of the Trump administration's frequent criticism of the group's treatment of Israel. Haley repeatedly voted against U.N. measures that were critical of Israel, and she has rebuked the council for what she called a “chronic anti-Israel bias." “The United States should be leading the world on human rights, not retreating into isolation and separating young children from their families. Because of our seat at the table, we’ve been able to give voice to the voiceless around the world while fighting for the council’s fair treatment of our allies like Israel. Today, President Trump is sending a signal to the world that we’re too weak to lead and too cowardly to fight for our foundational values.